Aditya Vaibhav | The TrickyScribe: Priyanka Chopra and Nick Jonas were declared man and wife after the two tied the knot in a Western wedding ceremony on Saturday at Umaid Bhawan Palace in Jodhpur. In course of the extravaganza that ensued, Priyanka and Nick, however, stirred up the hornet’s nest. Soon after they exchanged vows, the sky was lit up with spectacular fireworks in the evening. Many were dismayed. Priyanka, who is also an ambassador for Breathefree, a public service initiative for asthma patients, was criticized for fireworks. There is a context to it. Priyanka, on Diwali, had urged people to not burn crackers and contribute in making the planet pollution free. Twitterati, referring to the same video, went on to call the actress a hypocrite. Social media was flooded with pictures from Umaid Bhawan Palace. Toxic Fireworks: Smoke from fireworks combustion is likely to contain a mixture of sulphur-coal compounds, traces of heavy metals and other toxic chemicals. Combustion cloud can contain harmful gases including ozone, sulphur dioxide and nitric oxide. Harmful to Health: Metallic particles in the smoke emitted by fireworks pose a health risk, particularly to people who suffer from asthma. Colours and effects produced in these displays are achieved by adding heavy metals to the gunpowder. Fireworks Emit Carbon Dioxide: 270 grams of black powder releases 132 grams of carbon dioxide. Multiply the ratio (132/270 = 0.4889) with the volume of fireworks to get annual emissions from fireworks. The magnitude is enormous! Adverse Effect on Animals: Fireworks are generally loud; the vibrations travel far. Studies show that loud sound of fireworks affect wild as well as domestic animals adversely. Birds are petrified too. This fear makes them flee towards roadways putting them at risk of being rammed by vehicles plying on roads and the subsequent vehicle damage. Non-biodegradable Components: Although much of the residue from fireworks is paper, many ingredients of the firecrackers including sparklers are not biodegradable. Use of non-biodegradable components implies that the fragments will get washed out to sea or seep into groundwater. A recent UN report found that global carbon dioxide emissions rose for the first time in four years. “Now more than ever, unprecedented and urgent action is required by all nations. The assessment of actions by G20 countries indicates that this kind of action is yet to happen”, UN Emissions Gap Report – 2018 finds, warning that the goals set in the Paris Agreement – limiting global warming to 2 degrees Celsius above pre-industrial levels this century while aiming to stay below a 1.5 degree temperature rise – are getting harder and harder to achieve. Finding a global action plan against climate change is as necessary as it is difficult. As the chart illustrates below, per capita carbon dioxide emissions vary vastly across countries, making it difficult to come up with a plan to limit emissions at a global level without hurting the development prospects of emerging economies that feel limited responsibility for the climate crisis. The following statistic displays carbon dioxide emissions in India between 2001 and 2014. 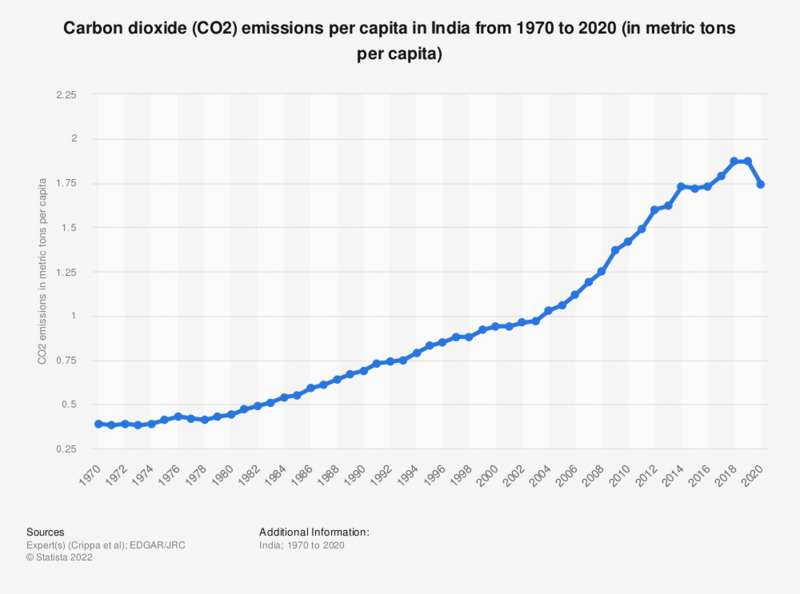 Emissions in India have increased from 1.1 metric tons of carbon dioxide per capita in 2001 to 1.7 metric tons of carbon dioxide per capita in 2014. Following is data depicting the total amount of carbon dioxide emissions in United Kingdom from 1990 to 2016. It shows that carbon dioxide emissions decreased over the years, going from approximately 637 million metric tons to 488 million metric tons of CO2 from 1990 to 2016 respectively. Let us not take this planet for granted. Emerging economies must understand their responsibility. People must reciprocate. Countries don’t respond to issues. The society is supposed to. Resilience on part of the community is the only way out. Else, climate change will continue haunting us.